Well it’s got to be said, the new collection at Habitat is looking pretty darn good. When it was bought by Home Retail Group in 2011 I never thought I would say that again. I thought it was doomed, it’s days numbered. But, with much credit to the buying and design teams, I think it’s fair to say that Habitat has probably surprised a lot of people in the industry by unveiling some very strong collections and not floundering. This season’s collections appears to be the strongest yet since it was saved from administration by Home Retail Group, who also own Homebase and Argos. Habitat don’t like to shout about the fact they are owned by Home Retail Group, and who can blame them. Habitat product is stocked in Homebase stores, but unless you spend time in Homebase you would never have to see Habitat accessories next to DIY essentials, and the connection to Home Retail Group is not evident on Habitat’s website. Within the ‘About Us’ section there is a sub-section called ‘Heritage’, which gives an overview on the heritage of the Habitat brand, which was founded by Sir Terence Conran and launched in 1964. Being a big interiors fan, I was genuinely sad when I heard that Habitat had been sold to Home Retail Group, it is undoubtedly part of Britain’s design heritage. However, when I walked past the Habitat stores on Tottenham Court Road recently, I really thought they were back in the game. In fact it is possibly the strongest high street interiors collection I have seen this season. 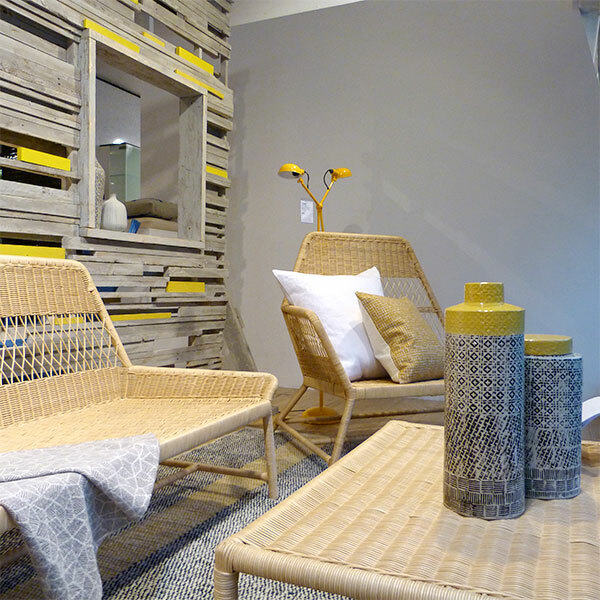 The window displays were fantastic, with some striking angular rattan pieces catching my eye, set against a backdrop of wooden panels with pops of green, orange and yellow, which are key colours in the collection. Compared to Heal’s which is next door, the trends and the product displays look far more inspiring. It’s a bold collection with strong outlines and graphic prints. Quirky accessories such as knitted pouffes and geometric woven rugs provide a retro edge, while powder coated metal floor lamps and metal pendant lights are central to the colourful look. Have a look online or get down to one of the London stores to see for yourself.